I ordered my brand new Gaiam yoga mat from Gaiam’s website and immediately received a order confirmation email. Being that it was just over in Washington, and I’m just a boat ride away I figured it wouldn’t quite take the full 7-10 days by mail. But yes it did. Infact I received it almost a full two weeks later. And when it arrived I had to pay an extra $21.05 COD (cash on demand). This sort of puzzled me, as I had already paid a hefty shipping charge of $21.99 on two yoga mats, one being very small. 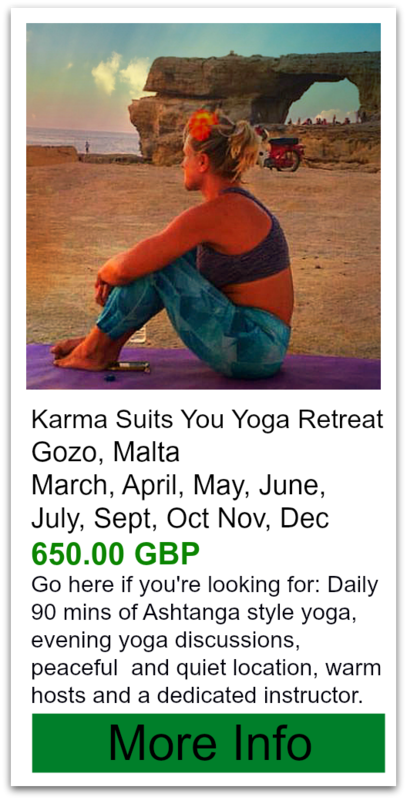 I emailed Gaiam to inquire about the extra charge. I was informed that because Gaiam was an American company I had to pay Canadian customs of having an item brought into the country. They can’t estimate the cost, so it’s left out of the original purchase. I was a little disappointed to learn this, but I guess it’s not Gaiam‘s fault. I don’t ever recall making an international purchase over the internet before! I was so excited to get it home and try it out! Barely through the door I open the small package and laid it down. As you can see when it lays out it will still have some wrinkles in it, but that really doesn’t bother me at all. Just thought I should mention it as some people are finicky about how their mat lays. The first thing I notice of course, because this isn’t a full yoga mat and rather a travel yoga mat there is no cushioning, at all. It didn’t really surprise me because it's made to fold down tiny into a suitcase or bag, but I was anxious to know how my practice went without any cushioning. I typically use a very thin mat, except when doing headstands (I use a thick mat or carpet for headstand) so the change wasn’t a huge difference. 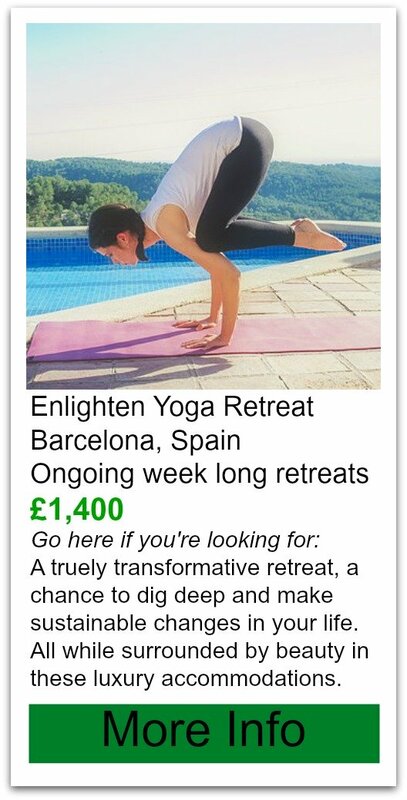 However, I mostly practice Ashtanga yoga with that type of yoga you don’t need alot of cushioning. Ie no asanas are performed while on the knees or applying pressure to any one area on the body…. Except shoulder stand! Ouch! shoulder stand is not recommended while using this mat! In child’s pose I can feel my knees on the hard floor under the mat but I wouldn’t say it bothered me. My big test for yoga mats is performing downward facing dog. I have a wide down dog and can’t tell you how many mats I’ve gone through trying to find one that actually sticks while doing my full down dog. 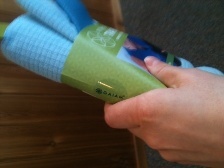 The Gaiam Travel Yoga mat initially failed the slip test. The one side of the mat is a towel like substance that is slippery and the other side is sticky rubber. So I flipped it over to try the sticky side up and see if that was feasible, as I hate adjusting my asana to suit a mat. Do NOT do this. Use the sticky side down and towel side up only. The whole mat slipped around crazily- this is not how it’s meant to be used. So I thought I’d give it another shot and continued with my sun salutations. As my body began to warm up my hands started to stick to the towel side of the mat really really well. It’s almost like sweat activated the sticky factor in this mat. The more I sweat the more I would stick to the mat. This was awesome! 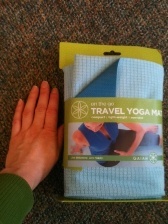 On my second try of the Gaiam travel yoga mat, I found that I missed the cushioning and wanted more than just a hard surface under me. I can’t quite get the full jump through of the vinyasa from down dog to sitting with the legs extended, so sometimes I slam my foot into the ground and it hurts a little... So I decided to use my Gaiam Travel Yoga Mat over top of the regular Gaiam (tree of life) Yoga mat. This was beautiful! I had super traction with my sweaty body and had a little extra cushioning. It was great. Infact, I will probably practice like this from now on! Another thing I love about this mat is that while performing a jump thru or transitioning from one asana to another if my toes or something inadvertently hits the mat it slides easily on the Gaiam travel yoga mat, unlike my super sticky mat that grabs it and won’t let go and cranks my toe in a direction it’s not supposed to go. Ouch! I would only recommend this mat for hot or very vigorous yoga where you sweat alot, otherwise forget it. Also, if you want a mat that’s low maintenance and easy to clean, this is NOT the mat for you. I don’t know about you but If I’m travelling I don’t want to have to do alot of laundry. Also do NOT use this mat for naked yoga unless you plan or throwing it in the laundry after every use. This mat is great when used more like a towel over a cushioned yoga mat. It is not recommended for use on it's own. 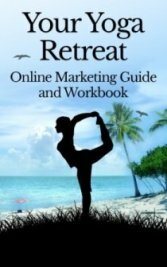 Have a great yoga product review?